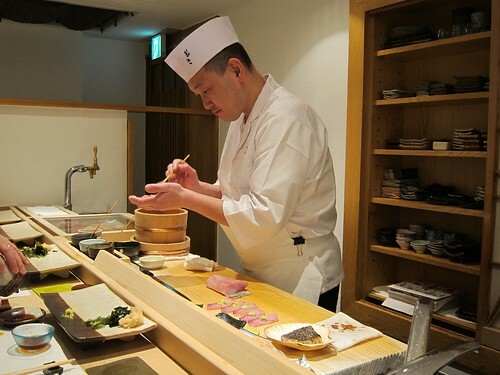 There’s something comforting, even relieving, about a 10-seat Kaiseki experience in Tokyo with an especially irreverent presence behind each course, each with unparalleled attention to detail. 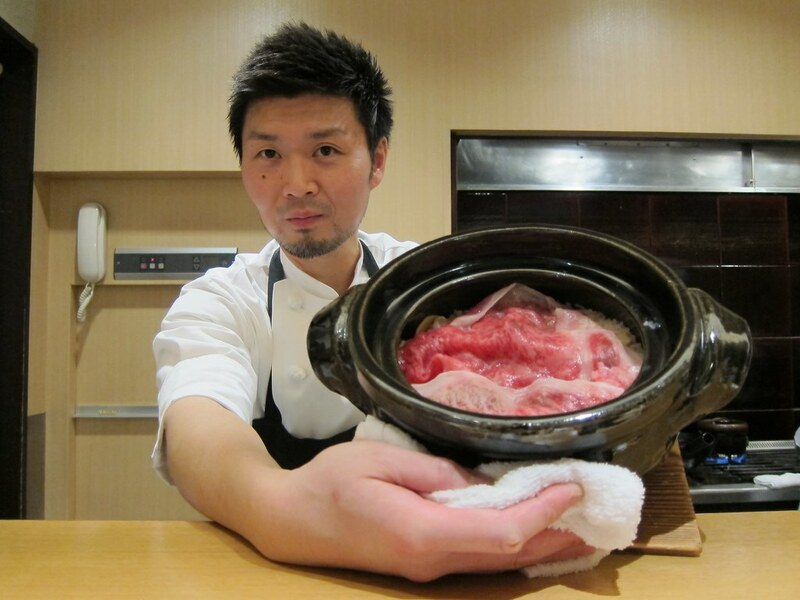 But that is Jimbocho Den, the brainchild of mid-30’s, owner-chef Zaiyu Hasagawa, whose wry sense of humor delightfully pervades every refined dish. I think I am ruined. I have had sushi in Japan and it was phenomenal. It was the best sushi I have ever had; nay, it was the best meal I have had in my entire life. It surpassed my wildest dreams, if they knew at which point to even begin. 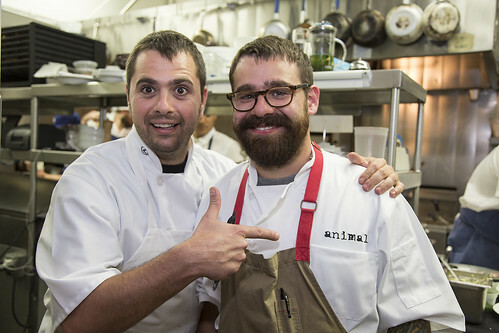 When you get offered car service in a Lexus RX450h to a celebratory dinner at Animal because Jon Shook and Vinny Dotolo are to be presented as the next Culinary Masters, you say Yes. Especially when last year’s anointed, Miami’s Latin fusion extraordinaire and longtime mentor to Jon & Vinny, Michelle Bernstein, is in town and also presenting dishes of her own at the dinner. 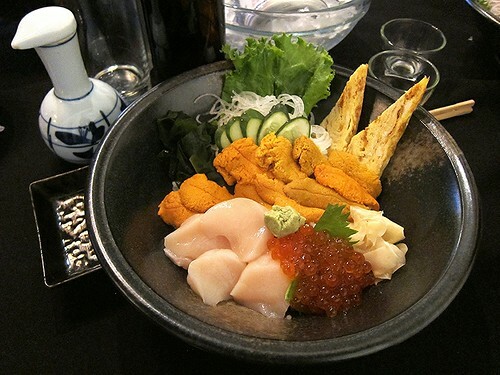 It may have been ambitious to have driven down to the South Bay on a Friday late afternoon, but we knew what we wanted, and what we wanted was uni. Having 4 people in my little Mini Cooper enabled us to use the 110 Southbound’s alternating Express Lane (it weaves in and out with more preference now given to FastPassers), which was key in our Silver-Lake-to-South-Bay commute and miraculously amounted to little more than a half hour. We made it to Maruhide’s resident strip mall just after its 5:30 PM opening and, though we imagined there being a line out the door, we were the only table seated for another 10 minutes. The Los Angeles restaurant world is always evolving, and at ever furious speeds. 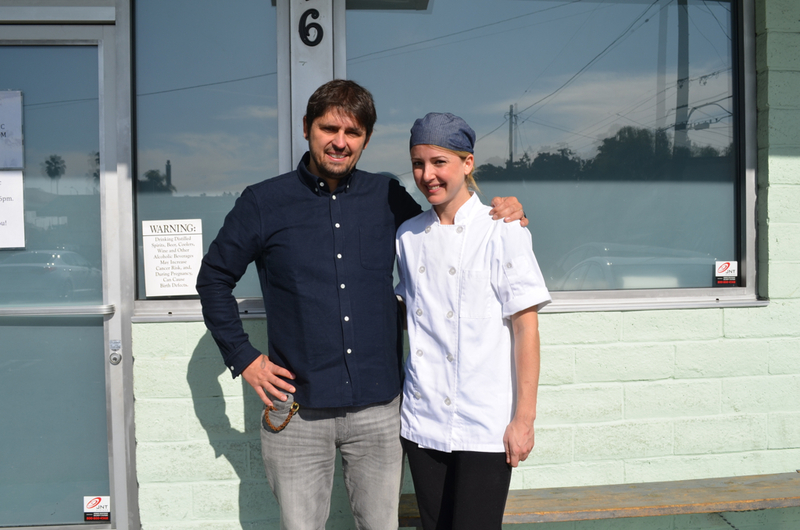 There’s a new restaurant every week, it seems, and while we can’t help but look up for a moment when something new comes around the corner, it’s important to remember the good ones that are worth going back to. 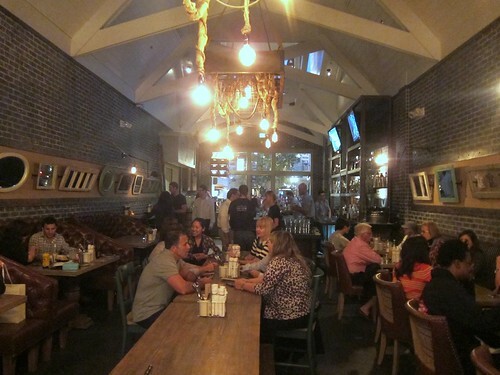 It’s always a great time to revisit Mo-Chica, the Downtown L.A. incarnation of which just turned 1 a month ago. And over the weekend, Peruvian Independence Day was the occasion to do just that. From the Deysi Alvarez’s glorious cocktails to Ricardo Zarate’s bold-flavored dishes featuring top-notch seafood framed by exotic ingredients like rocoto, choclo and quinoa, it was a welcome reminder that despite all that, this is an accessible, delicious destination without the fuss near the Historic Core. When you visit an outpost of such a well-renowned hotel entity as the Ritz-Carlton, its flagship restaurant has plenty to live up to. 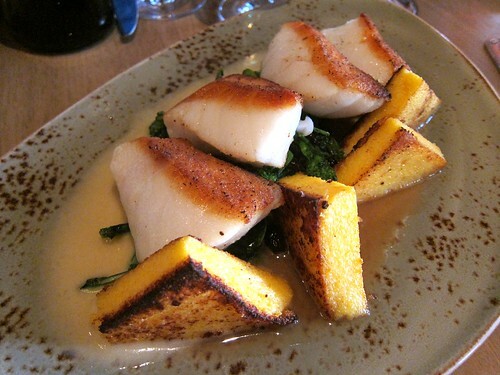 And with a location and view right on the shore at Half Moon Bay, the food better be a match to its scenery and splendor. Navio lives up to the task thanks to Chef Sean Eastwood’s imaginative dishes with ingredients sourced from nearby markets, but this is the Ritz-Carlton, and they have come to expect a certain clientele that can afford the high-end ticket – the kind of clientele that also subscribe to the mantra of “location, location, location.” With that: Scenery. The 10-year-old Grove was built to be the Anti-Mall. Everything, from the height of each streetlight down to the exact height of the curb is so calculated so as to appear as if it were…not. It’s a collection of stores within the same structure, but meticulously manufactured to evoke a stroll down the street – with fake snow in the “winter,” to boot. But that is the masterpiece that is The Grove, and its success at that intangibly cozy feel doesn’t seem to be letting up anytime soon. There are bites, and then there are bites. The bites are the kind of thing where you warm up to a beautiful place with just the right ambiance. The tastes are deceptively good. Then, you proceed to order more and more, ultimately staying for what accumulates to an all-out meal. I am a grazer, not a gorger; I love bites. Now, a great place to do exactly that is Whist at The Viceroy in Santa Monica – a place where the indoor dining options are just as charming as the outdoor, with the latter coming full circle thanks to poolside and cabana options. 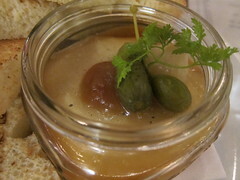 Chicken liver mousse with pancetta on crostini? Heavenly. 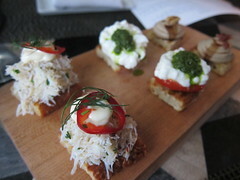 Dungeness crab cake with yuzu on crostinis? Refreshing. 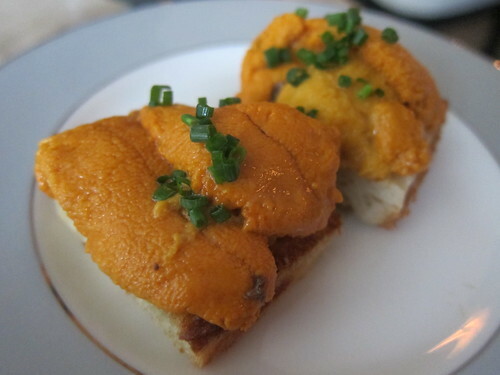 And of course, it’s not enough to put just uni on crostini, but to add lardo? Indulgent. And perfect. The real problem is that if you don’t have a few camarades with you on this little dining adventure, you’ll probably get real full before you either: 1) Get to try all the bites you wanted to, or 2) Get to any of the also-solid main dishes available. After all, you can’t forget about the juicy, flavorful Lamb Kafka Meatballs, topped with orange, pistachio and yogurt. Nor the beautifully cured hamachi with rhubarb “ponzu,” cucumber, radish and celery. All this, while having to avoid getting full on their extraordinary corn bread, which Chef Tony DiSalvo makes with three different renditions of corn to achieve that robust flavor. 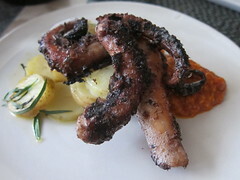 Oh, and that perfectly prepared Grilled Octopus with romesco, potatoes and charred wild leeks. It’s the kind of octopus dish that converts all those naysayers who’ve assumed octopus, by nature, is chewy. The tentacles are tender and flavorful, yet finished with a crispy exterior. 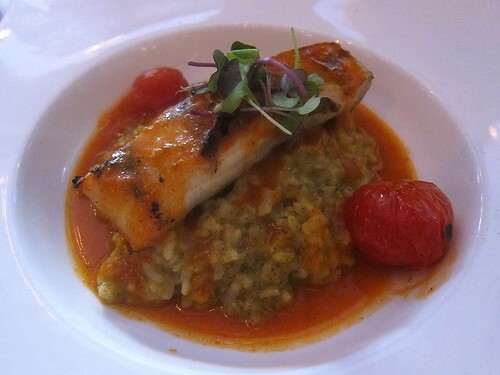 But of course, I must move on to the mains, a favorite of which was the Broiled Halibut. The filet came perched on a bed of deliciously smoked potato-miso puree and paired with crispy asparagus and ginger. It was a surprising winner – simple but a perfect combination of flavors. The smoke was a nice and unexpected touch. And as for some other mains, sweetbreads lovers will love this version prepared with morels and fava beans in sherry. But if you’re looking for something a little lighter than that, the potato gnocchi are just as much a treat (and doubles as a vegetarian alternative), with asparagus and morels rounding out its buttery essence. If I were to pick the one essential dessert at Whist, it would be the Rhubarb tart with its buttery crust and walnut crumble on top. Of course, it comes a la mode with vanilla ice cream. Just try it. It’s just one of those desserts where if you thought you were full before, you’ll realize you do have enough room for dessert. All of it. So check out Tony DiSalvo and Chris Crary’s new bites, served in their chic dining room or outdoors. The tastes are just too fabulous to allow you to get too distracted by the hotel, pool or any of the beautiful views and ambiance they afford. There’s something poetic about a restaurant that knows its place. 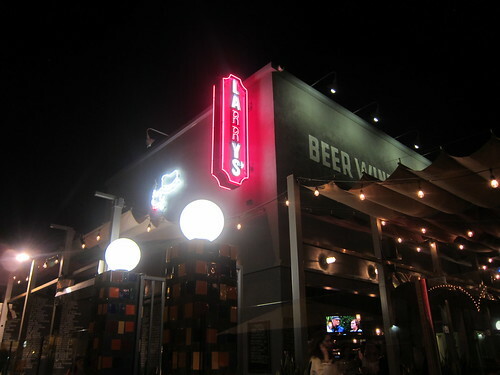 Larry’s, located on the beach and open since mid-August, seems to embody that with its beautiful, convertibleÂ patio and simple menu. Not a single item on the menus (printed on paper and ready for you to tally as in a sushi bar) is over $15, yet hardly any of the dishes lack in heft. Rather, full flavors – and beer, complete with 26 tapsÂ – seem to be the focus at Larry’s. It may be Vegetarian- and Vegan-centric Venice, but omnivores can appreciate the wide selection of charcuterie, flatbread toppings and small plates doubling as entrees; there’s plenty of meat on this menu. Such asÂ the delicious pot of chicken liver & foie gras parfait (nothing like duck liver to even out the pungency of chicken liver). You can also order the charcuterie and cheese – a solid representation – either to start or to nibble on during the length of your stay. Nothing is parsed out as appetizers or mains, and it serves as a plus. No one is going to scold you if you want to share your organic sal, I’m sorry,Â bacon-wrapped organic salmon with your friends. Flatbreads: check. The crust is respectable (could it be the water?) and the variety of topping combinations is enough to keep anyone satisfied. The Green Curry Mussels – a staple at any gastropub – were good and maintained its status as a reliable dish. 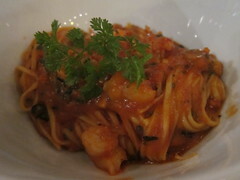 Surprisingly, one of my favorites was found in the capellini pasta, which was a Shrimp & Maine Lobster Ragout with lobster tomato sauce, basil and truffle. While sampling some of the heavier items (yes, even sampling does this) had me worried about passing out on my drive home to Hollywood, it was this pasta that was ironicallyÂ the standout. That is, in addition to sipping Ommegang’s Hennepin Farmhouse Saison and a New Belgium Hoptober. While you won’t go to Larry’s to achieve your latest culinaryÂ epiphany, Chef Brendan Collins (Waterloo & City) does a great job setting upÂ a solid menu forÂ this gastropub-by-the-beach. They also tap new, localÂ and/or rare brews there once in awhile, such as Atwater Village’s brand newÂ Golden Road Brewing Company’s Point the Way IPA. Whereby I normally avoid the beach in most things food-relatedÂ (it’s about the view, isn’t it? ), Larry’s, with its wide draft selection, beautiful people and unmatched outdoor-indoorÂ backdrop,Â really can’t be beat. All food and beer were hosted.